Now’s that time when Fescue lawns have reached their low point. But have no fear – it’s a normal phenomenon, and with an effective Atlanta lawn care program, you can get your turf looking lush and green in no time. Schedule Aeration and Overseeding: If you haven’t already made your appointment, call us today. We’ll be providing these services through October. 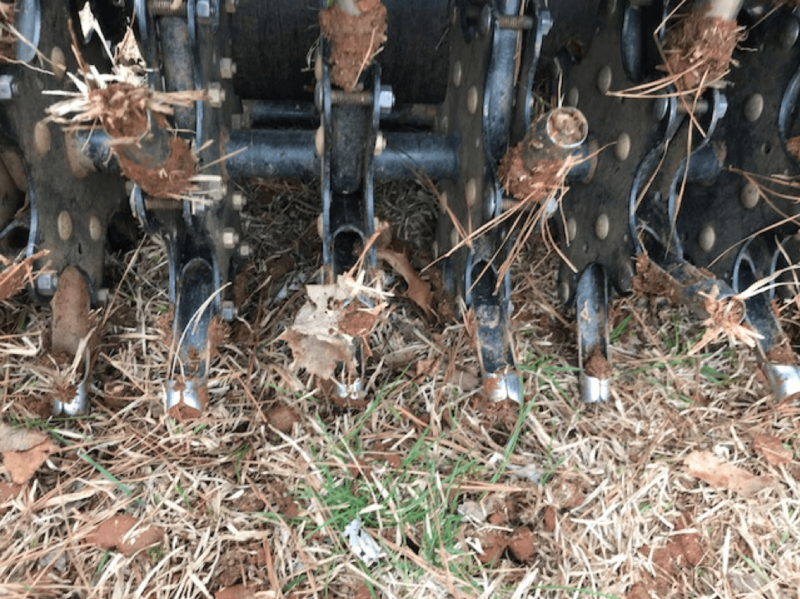 Aeration: Aerating helps to break up the soil, reducing compaction and allowing air, water and essential nutrients to travel freely to the root system. We firmly believe in core aeration that removes plugs of earth, as other methods can actually further compact your soil. Overseeding: This is performed after aeration. We sow seeds over your existing grass to help fill in thinning areas and bare patches that have formed over the course of the summer, resulting in a thicker, richer lawn. Aeration and Overseeding Aftercare: Don’t let your service go to waste. Follow these tips to ensure that your new grass flourishes. Water, Water, Water: It’s crucial to keep your newly seeded areas consistently moist for a full three weeks after your aeration and overseeding service. Water once or twice a day until the grass grows to mowing height. Make sure that the top ¼-inch of soil remains moist to ensure the seed never dries out. Be sure your irrigation system is covering your entire newly seeded area. Let the Weeds Lie: We won’t treat for weeds until after the new year, to ensure that all the new grass has time to establish, and we suggest you do the same. Weed control can harm new grass growth, and besides, the best defense against weeds is the dense, healthy turf you’re working towards. Lay off the Mower: Give your mower a break until the new seedlings have grown to three to five inches, and then only remove one-third of the blade height. Limit Traffic: Mark off your newly seeded areas, especially around Halloween when increased foot traffic is likely. You want to give your new grass time to establish roots that will last. Fall Feeding: September and October are key times for fertilizing Fescue lawns. Make sure fertilization is done after temperatures drop, as you don’t want to risk damage from drought or fungus. And go heavy on the nitrogen, using a starter fertilizer for your freshly seeded lawn. Of course, if you’re on one of our programs, we’ve got all that covered. Fescue lawns offer a lot of benefits in our Atlanta climate, including shade and drought tolerance. They also stand up to poor soil, traffic, and erosion. Cut your lawn a little slack this time of year, and take these steps to ensure your grass will bounce back to its full potential in the next few weeks and months.